In Furniture > Sofas > Show & Tell. I found this Cadillac couch last year at an estate auction in Indiana. This man had everything at this sale. This was a sale that had collectible cars, signs, furniture, gas pumps, it was just incredible. There were hundreds of people there. The man got caught doing something he shouldn't have been doing and well they were getting divorced. Him and his spouse couldn't agree on how things should be divided so there was an auction. I'm sure we have all been to one of those kinds of sales. Well there were bargins there for everyone. I saw some things go cheap! I was lucky that there were two rings going at the same time and I got this 1959 Cadillac couch. It's like brand new. It looks great out in the man cave, and it's really comfortable. The black and red looks great together. The tail lights and running lights light up. Those big fins just look great. This was the only thing I brought home that day. I'm so glad I got this because it made the man cave all come together. I've seen a few of these they also made a '57 Chevy couch. Thank you oilman514 and electobacco for the love! Have a great afternoon! Love those 59 cadillacs fins! Thank you bahamaboy and destiny.g.v. for showing some love! Thank you James and trukn20! Well to tell the the truth oldmade I haven't had a drink in 16 years! I'm high on life, but don't care if anyone else wants to. I love it when people stop over and say hi and stop and talk for awhile. So there you are your invited anytime. I live in Brownsburg. Thank you REED for the nice comment! Thank you willamal and Chevelleman69! I'll be up to 'sit-a-spell' as soon as it warms up ! I mean i's 90 outside right now and its 5:30 PM..................But we get a breeze ! It's been raining here part of the day. But it's a nice Spring day. Ultimate furniture piece for a man-cave....doesn't get any more "cool" than this! Thank you cronan3 for showing some love! Welcome to the site! Thank you Steeltoad63 and Grendelking! Thank you collecting for the nice comment! Thank you vasunshine for the love! Thank you aycockonxion and JonesFamily! Thank you kellis79 for stopping by and showing some love! Thank you AntigueToys for stopping by and showing some love! its the lights that do it for me! Thank you mikielikesigns2 for the love and the nice comment! Thank you ERMELIN for stopping by and showing some love! Thank you crswerner for the love on the Cadillac couch! Thank you PhilDavidAlexanderMorris for the love! Do you recall what it sold for? It's like you live in collector heaven, everything is so beautiful. Thanks for sharing all your great treasures. I really enjoy looking. Thank you pops52 (Ken) for the love and the kind words! You made my night with your nice compliment! Thank you PhilDavidAlexanderMorris for loving this again and taking it to the top!! Thank you Eyewideopen for the love! Have a great week my friend! Very neat couch... My son works at the place or a place that builds them. Recent episode of American Restoration had one of their couches on the show, but made it sound like the show people put it together. 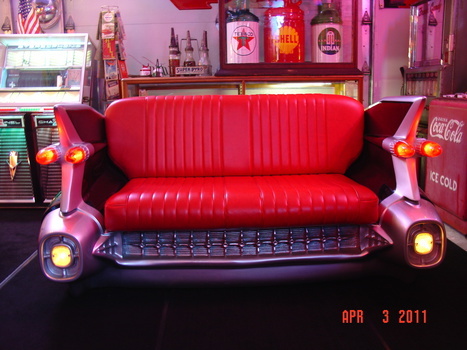 The real classic couches use actual car parts with all the original chrome. This one appears to be alot of fiberglass or plastic.Take a look at their web site http://www.clasiccouches.com. Thank you neat.old.stuff for the love! Thank you geo26e, rikanddonna and RAD21289 for the loves! Thank you aldo78 for the love! Thank you vintagegirl66 and CindB for the loves! Thank you surfbub66 for the love and the nice comment! Thank you charmsomeone for the love! There are some restaurants here in Cali that use these as display booths. They are representative of the old "Car Hops" serving burgers and fries with the waitresses on roller skates. It's pretty good! Cool that you got one! Thank you kyratango for the love! Thank you shareurpassion for the love and the nice comment! Thank you aura and Pinback64 for the love! Thank you charmsomeone, Jlmam and bijoucaillouvintage for the love!